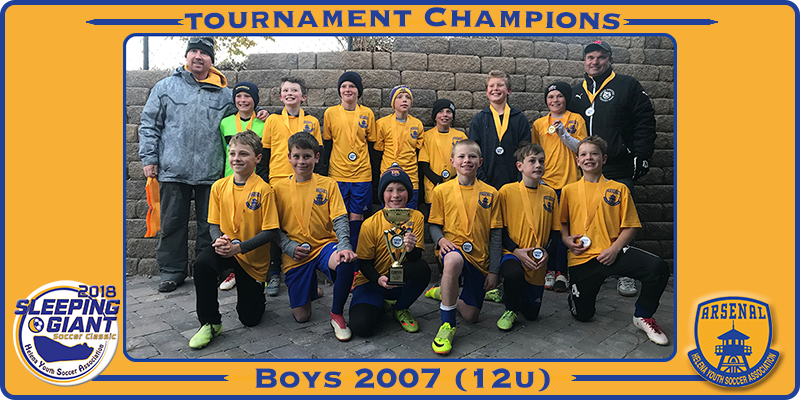 For the third consecutive year, the Arsenal 12u boys blue team was crowned Champions of the 2018 Sleeping Giant Soccer Classic Tournament which was hosted in Helena on October 13 & 14. This outstanding group of young men coached by Glen Wall and Stefan Wall went 4-1 over the weekend. The first match was a cold, hard fought contest, with Missoula Red pulling off the victory 3-4. Goals in this game came from Wyatt Lawson, Luke Andersen, and Dallin Wall, with our lone assist coming from Griffin Norberg. In the second match, the Helena boys won over GESC Yellow 5-0. Goals were scored by Luke Andersen (2), Noah Knapp, Dallin Wall, and Cohen Koch. Assists were from Dallin Wall, Wyatt Lawson, and Zephyr Wall. For the third match, Helena won 6-0 over Flathead Green. Goals were scored by Cohen Koch (2), Jacob Jost, Mason Burrington, Henry Sund, Dallin Wall. While our assists came from Cohen Koch, Connor Champagne (2), and Luke Andersen. During the Simi-Final match, the boys ran past Missoula White 7-0. With goals from Cohen Koch, Luke Andersen (3), Mason Burrington, Wyatt Lawson, Zephyr Wall. Assists came from Jacob Jost, Wyatt Lawson (2), and Noah Knapp. In the Championship match, the Helena boys over came much adversity to beat the GESC Black team 1-0. With only 15 minutes of rest between games and no subs in the last 20 minutes of the game (due to injuries) the boys were able to pull out the win. Dallin Wall scored the lone goal of the game assisted by Luke Andersen. The Helena Defense had 4 straight shutouts and was lead by Connor Champagne, Mason Burrington, Drew Esponda, Griffin Norberg, and Henry Sund.